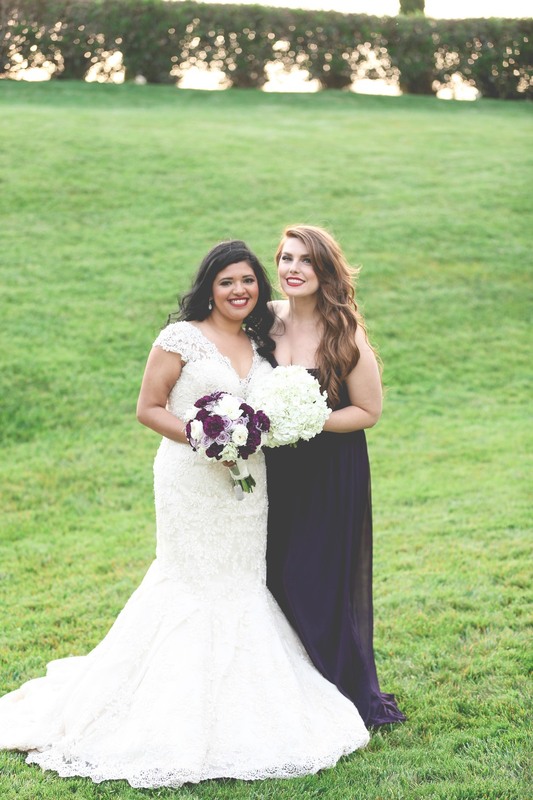 We first met Kis last year as a bridesmaid in Maria & Mike's wedding at Brookside Country Club. When she contacted us to inquire about her own wedding day it was quite a surprise. During the consult, we were even more surprised when she told us her hubby to be was also named Mike. It was great catching up and learning about their winter wedding plans. She knew they wanted to have an engagement session but wasn't quite sure where. So at the time of the consult we left that to be determined. Needless to say the Palace of Fine Arts was a wonderful location, check out a few shots from their lovebird session below. We've all heard of the 4 C's when it comes to picking out diamonds...for a certain ring, on a certain finger, usually comes with a handsome fella down on one knee ;) Over the years as wedding photographers we've come to notice that not only diamonds but bridesmaids can be rated with a 4 C measuring scale. And that, our dear brides to be, is exactly what we'll be sharing with you all today. Closeness, Coolness, Cuteness and Craziness...otherwise known at Mr & Mrs Photography as "The 4 C's." Like diamonds the C's have levels and also like diamonds some flaws you can live with and some are deal breakers. For instance cuteness can get passed on if your closeness level is at an all-time high. craziness is something that you can go without as long as the coolness level is relatively high... so on and so forth.. you guys get the point. The above pie chart in bridesmaid trems is called a unicorn (the equivalent of having a flawless diamond). we all know how precious and rare flawless diamonds can be so if you have a unicorn as a potential bridesmaid, first pinch yourself to make sure your not dreaming then quickly and swiftly invite her to be a bridesmaid in your wedding. CLOSENESS: Sitting at number one on the priority list and with 35% weighted on the perfect bridesmaid scale, closeness is definitely not something you want to skimp on. When it comes to your best friends, your sisters, and your relatives these people are no-brainers for bridesmaids. But once those lovely ladies run out and you dip into friends, coworkers and acquaintances from high school, this is when closeness should play a vital part in the selection process. COOLNESS: this C comes in at a close second. why coolness you might ask? well its imperative that you choose bridesmaids who are OK with going along with all that a wedding day includes. You want them to be cool with walking in heels, taking pictures in the hot sun, going without eating for a while, waiting to hit the bar, and smiling endlessly and effortlessly for photos that you'll be wanting to cherish for a lifetime. Nothing kills a bridal party sesh like a bridesmaid who does not want to be there and lets it show all over her face. If you know your feet will hurt 5 mins into the photos by all means pick out some comfy kicks! Cuteness: On the list at number 3 is cuteness aka hotness. This part is easy, everyone knows who their cutest friends are. This one is STRICTLY for your photos and enjoyment of all the single men attending your love celebration. The truth of the matter is the subject makes the photograph. So if you have ABSOLUTELY stunning bridesmaids chances are you're going to end up with some ABSOLUTELY stunning photographs. yes it's weighted a lot lower than something as important as closeness but let's face it attractive bridesmaids are sort of expected at weddings. However you should never x out a potential bridesmaid on their cuteness factor alone. CRAZINESS: Last of the C's but definitely not least is craziness. You have to make sure you pick bridesmaids that are your same kind of crazy. this makes for fun photos, an extremely fun evening, and endless memorable moments at your wedding. Not everyone is into being silly and taking playful photographs but if you are, this is something to keep in mind. Will the bridesmaids you choose participate in the shenanigans you have planned for your big day? The one thing you don't want to happen by not choosing wisely is end up with a sour Susan or a Debbie downer in your wedding party.